In the late 1990s, when the Internet was new and very few parishes understood the value of websites, I designed Virtual Tours of churches. When an “early adopter” priest (or technology committee) asked me to build a website for his parish, my Virtual Tours evangelized by adding scriptures and explanations to photos that began with the front door and took the viewers to the baptismal font, altar, stained glass windows, etc. They even got the attention of the Pew Research Center, which recommended my parish’s site as an example of evangelization. Please download this TED video by Michael Bodekaer and watch it on your computer, now. As you see what can be done for university students, think of what can be done for the Faith. Next, download this TED video by journalist and VR pioneer Nonny de la Peña, and watch it to see why immersion education using Virtual Reality is so very effective in changing hearts and minds. Imagine how this can be used to make the world a better place, with Christ leading us. Today, we can put GNM on the leading edge of using VR technology for faith-based education and online retreats. By researching this now and seeking out early steps that are possible now, we are poised to pioneer it for the Church. 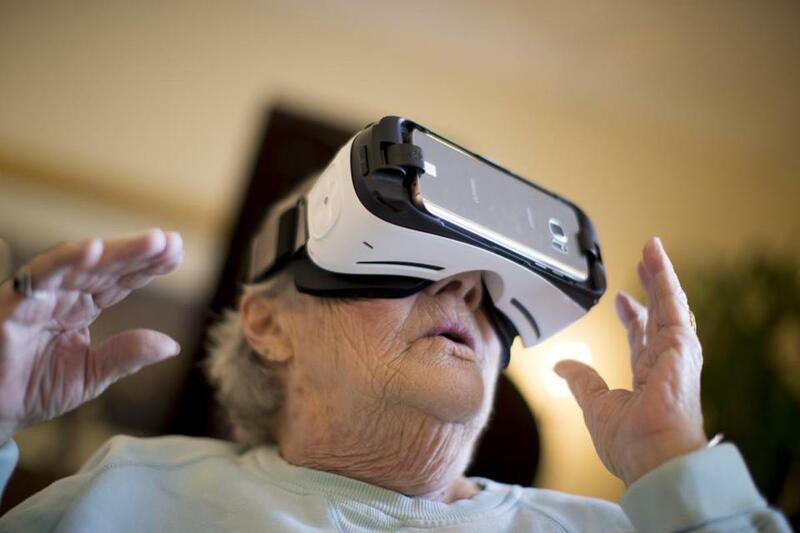 Technology experts who study social trends are giving evidence that the next social network site to become THE online social gathering place will be a virtual reality site. Imagine what Good News Ministries can accomplish as one of the first (perhaps THE first) developers of VR faith-education apps and videos for the Catholic Church. 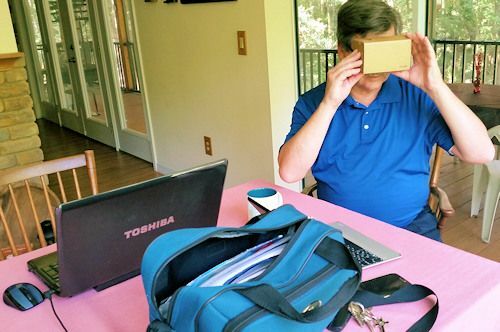 Bob Metivier, GNM’s Media Director, tests Google Cardboard for the first time May 25, 2016, during our second VR development meeting. If you have a VR headset, download into your smart phone GNM’s VR worlds! You can also view them right here! Move all around and zoom in: After starting the player below, click the three dots that appear in the upper right corner, and then the question mark, to find out how. We are actively using my back yard as a Virtual Reality Retreat Center (as of June 17, 2016). You are invited now to join the discussion and help Good News Ministries pioneer the use of Virtual Reality for Retreats and Courses! If you have any skills that might help, contact me — we are building a team that includes script-writers, videographers, video editors, 3-D graphic artists, narrators, testers and reviewers, etc. If you believe in the evangelizing power of Virtual Reality and would like to support it financially, contact me. If you know how to search and apply for grants that will underwrite GNM’s VR development, contact me. 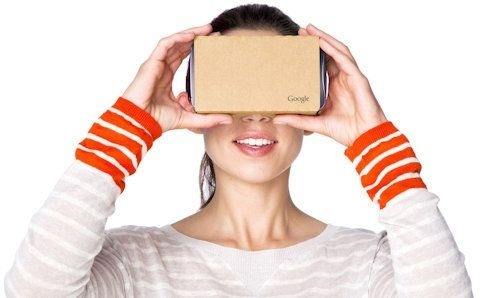 If you design apps, if you’d like to be one of our developers, see developers.google.com/cardboard. And then contact me. Contact me now to get involved! This entry was posted in Exploring VR on May 16, 2016 by Terry Modica. The reality is really awesome… I like the posts and videos about new technologies. All the best!